We did not attend the reunion this year. Doyt Sheets, Rebecca Cox, and Bobbie Jones were kind enough to fill us in. Doyt sent the summary and all shared many photos. 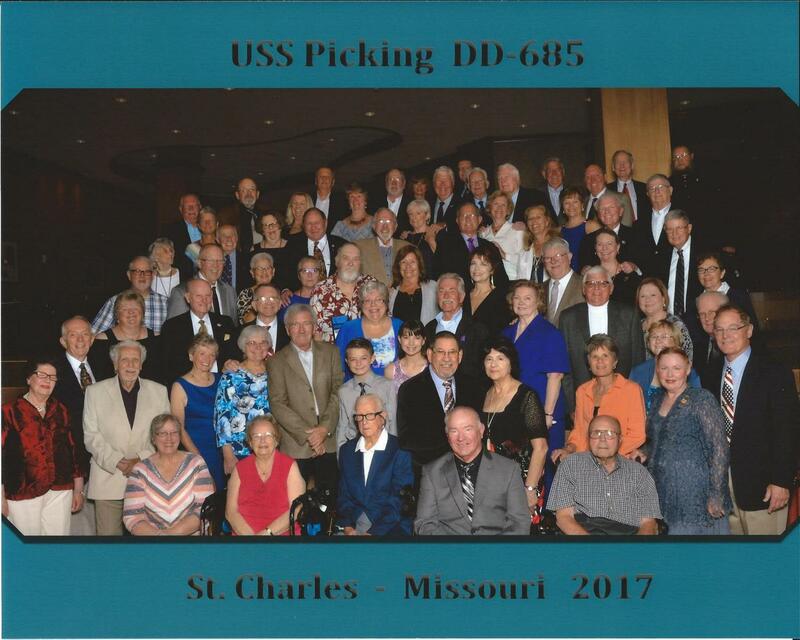 The 2017 Picking Reunion was held October 9th thru October 12th in St. Charles, Missouri at the Embassy Suites St. Louis/St. Charles Hotel. Our hosts were Cheryl and Mike Overschmidt, Tom Overschmidt, and Mary Beth and Dave Strassner. Hotel accommodations were great. A complimentary cooked to order breakfast was available each morning and snacks and free drinks in the evening. Each room was actually a two room suite. St. Charles is a quaint town located some 20 miles north of St. Louis on the banks of the Missouri river. It is probably best known as the starting place of the Lewis and Clark expedition. Several blocks of Main Street have restored buildings of the time. The buildings contained many shops and restaurants. The street is still paved with bricks. A free trolley that stops at our hotel is provided by the city. The trolley also stops at a casino and several points in the downtown area. Monday was registration day and the hospitality room opened in the afternoon. Folks visited in the hospitality room and many took advantage of the trolley to tour the downtown area. Tuesday was our first tour. Guides in historic dress boarded each bus. They pointed out historic buildings and gave us some history of the city. After dropping the guides, we headed south to St. Louis and the Gateway Arch National Monument. Several of the group rode the tram to the top of the 630 foot high arch. However, the view was obstructed by low hanging clouds. We were able to view a video of the arch construction in the museum at the base. We then crossed the street to the Mississippi River for a cruise on a replica nineteenth-century paddle-wheel riverboat. A delicious buffet style lunch was ready as soon as we went aboard. Entertainment was a piano and banjo duet performing songs of the time. We cruised for about 2 hours enjoying the afternoon on the river. There was a great view of the arch as the clouds lifted. Several of our group got behind the wheel for a photo-op and steered the boat. After the cruise, we boarded the busses and headed back to the hotel and the well stocked hospitality room. Wednesday morning saw us boarding the busses for Jefferson Barracks. This is one of the National Cemetery Administration’s oldest interment sites. It has served as a burial place for soldiers of all wars. During the Civil War, Jefferson Barracks served as a training post for the Union Army. We toured the cemetery then stopped and held a short memorial service for those crew members whose passing we had learned of since the last reunion. As each name was read, a bell was rung. After the last name, a bugler played taps. The group then divided, one going to the Missouri History Museum and the other to Cathedral Basilica of St. Louis. The Basilica is one of the largest (if not largest) churches in St. Louis. It is the Spiritual center of the Archdiocese of St. Louis. Many mosaics and artworks cover the interior of the Basilica. The History Museum collection includes both national artifacts as well as Missouri and St. Louis related materials plus items relating to Charles Lindbergh and his trans-Atlantic flight in the Spirit of St. Louis. Both groups met at the museum and had lunch there at Bixby’s. We then returned to the Hotel for an evening in the hospitality room. Thursday was a free day until the evening when we gathered for a group picture before the Banquet. Once the pictures were taken, we headed to the banquet room. After a welcome and Pledge of Allegiance to the Flag, a delicious meal was served by the hotel staff. Our speaker for the evening was Kevin Keough, Son of Captain Raymond Keough, USS Picking. Kevin gave an inspirational speech based on the life of his father. After the speech, Cynthia Daniels presented Kevin with one of her beautiful hand made quilts. A drawing was held for several door prizes. Sue and George Brunson announced they would be hosting the 2019 reunion in the Chicago suburb of Shaumburg Illinois. It is tentatively planned to be in the Embassy Suites Hotel. We closed with the singing of Anchors Aweigh.